Even after a century later, cars are still the most common form of transportation used around the world. They are also getting cheaper and cheaper as we move towards the technologically advanced future. However, the future of these 4-wheeled metal boxes looks a bit different. Experts predict that in a few decades time, there will be no mechanical cars around as all of them will be replaced with their electric descendants. This might be good for the future, but it is also a bit sad for the car enthusiasts. We are surely going to miss the screaming exhaust noises when we used to accelerate the cars. Speaking of exhausts, they play a vital role in getting rid of the extra gases coming out of the engine. Since combustion engine uses a mixture of air and fuel to create mini explosions inside, it leaves out extra carbon dioxide which needs to get released. The exhaust system then efficiently gets rid of the carbon dioxide in the most efficient way possible. The importance of the exhaust system should never be undermined. A broken or faulty exhaust system will not only be harmful to the environment, but it will also cause troubles in the performance of the car. 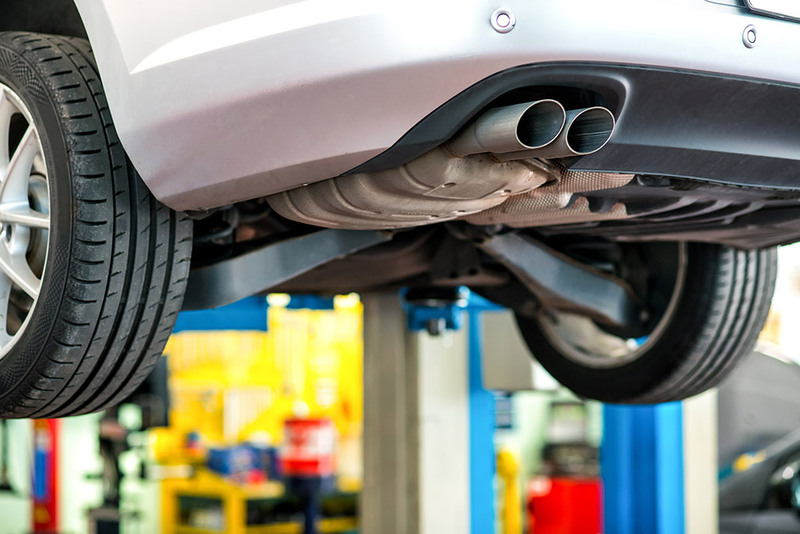 therefore, if you notice any sign that indicates trouble with the exhaust system, then immediately take your car to the best auto repair in Grapevine, TX, to fix it. A good tuned race exhaust surely produces a melodious sound that is music to the ears. However, not all kinds of cars feature a tuned up exhaust system and most of them are designed to be as quiet as possible. Therefore, if you start hearing overly loud noises coming out of the exhaust system of your car, then something is definitely wrong with it. You need to take your car to the best auto repair in Grapevine, TX, to get it fixed. The annoying noise coming from the engine is a major indication of a broken exhaust system. Many times this noise is caused by a damaged manifold gasket. Other problems can be a damaged or completely broken muffler. To diagnose the source of the problem, simply ask another person to rev the car while you stand outside. If the noise comes directly from the engine, then it’s certainly the manifold gasket. If it’s emitted from the rear end, then the muffler might be damaged. In either case, you need to replace or repair the exhaust system of your car. Take your ride to the best auto repair in Grapevine, TX, to get it done. If you have been driving your own car for a while, then you might be familiar with its power and acceleration feel. So if there’s even a slight decline in the power output and acceleration of the car, then you will notice that. There are many reasons for the decreased power and acceleration of the car, and an exhaust system problem is certainly one of them. The exhaust system of the car is responsible to get rid of the wasteful gases that are created from the engine’s combustion. The faster it gets rid of the output gases, the better the engine will perform. A blocked exhaust system can be a huge obstruction in a car’s acceleration and power output. Therefore, you should consider this a major indication that something might be wrong with your exhaust system. Take your car to the best auto repair in Grapevine, TX, to get it fixed immediately. Every car owner is well familiar with the mileage of the vehicle that they drive every day. So, if you notice a significant decrease in the fuel efficiency of your car, then the exhaust system might also be responsible for this. As discussed earlier, an exhaust system has a significant impact on the power output and acceleration of the car. Similarly, a blocked or faulty exhaust system can affect the fuel economy of the car. Since the exhaust won’t be able to get rid of the fumes quickly enough, the car will have to work harder than it should. In this way, the fuel economy of the car will be drastically reduced. Therefore, if you notice a drop in the fuel economy of your car, then get your exhaust system fixed or replaced immediately. Take your car to the best auto repair in Grapevine, TX, to get it looked at by the professional mechanics. If you suddenly start smelling gasoline inside your car, then take it as a major symptom of a broken or faulty exhaust system. The leaky exhaust system can radiate the smell of gasoline in and around the car pretty easily. It is also quite a dangerous indication, and you should be extremely careful in this situation. Do not light anything in and around the car and also don’t ignore this problem at all. Immediately take your car to the best auto repair in Grapevine, TX, to get it fixed. If you start hearing scraping noise, then it might be because your exhaust is hanging beneath your car. You should not ignore this problem as the exhaust system might be further damaged and you may end up paying more for the repairs then you should. Therefore, take your car to the best auto repair in Grapevine, TX, immediately after noticing this symptom. If you are looking for the best auto repair in Grapevine, TX, then the best place to find it is at Import Car Center. We specialize in providing all kinds of services for the import cars. We also have experience dealing with import luxury car brands such as BMW, Audi and Mercedes-Benz.